It’s quite something to see yourself in print. 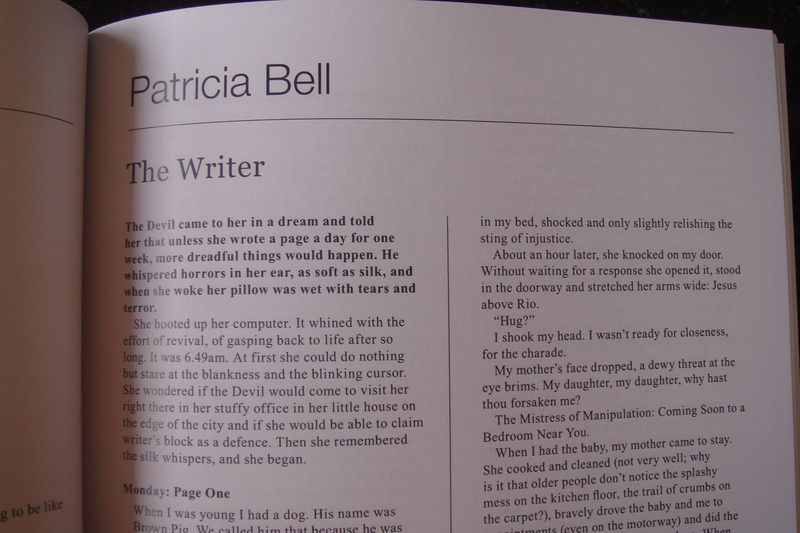 This story was published in the April 2013 issue of Takahē, a New Zealand literary magazine. I received my copy in my letterbox today. I have posted the story previously, but for the sake of ease, here it is for those who haven’t read it before. The Devil came to her in a dream, and told her that unless she wrote a page a day for one week, more dreadful things would happen. He whispered horrors in her ear, as soft as silk, and when she woke her pillow was wet with tears and terror. She booted up her computer. It whined with the effort of revival, of gasping back to life after so long. It was 6.49am. At first she could do nothing but stare at the blankness and the blinking cursor. She wondered if the devil would come to visit her right there in her stuffy office in her little house on the edge of the city, and if she would be able to claim writer’s block as a defence. Then she remembered the silk whispers, and she began. When I was young I had a dog. His name was Brown Pig. We called him that because he was brown and fat. One day Brown Pig didn’t come in for his dinner and my mother sent me out to look for him. It started to rain and I remember that I had only a thin T-shirt on, and shorts and sandals. I walked maybe a hundred metres down the road, my sandals squelching and my eyes half-closed against the increasingly fierce cheek slaps, before I heard a single bark from a house to my right. It was a smallish, two-storey plaster-clad house. The woman who answered the door was very kind. She invited me in and I saw Brown Pig curled up contentedly on a towel on a large green couch. And she saw how wet I was and offered me my own towel, and a hot chocolate. And I said yes to both. Years later, in a different city, I met a man called Michael. And as we were courting I discovered that the smallish plaster-clad house was his childhood home, and that it was his mother who had looked after Brown Pig. And he was home that afternoon, but upstairs reading. And I wonder, if Brown Pig hadn’t gone to that particular house that day, would I have married a different man? After she had written the first page, she went back to bed, but she didn’t sleep. When I was ten years old, my mother slapped my cheek, hard. I can’t remember why. I buried myself in my bed, shocked and only slightly relishing the sting of injustice. I shook my head. I wasn’t ready for closeness, for the charade. My mother’s face dropped, a dewy threat at the eye brims. My daughter, my daughter, why hast thou forsaken me? The Mistress of Manipulation: Coming Soon to a Bedroom Near You. When I had the baby my mother came to stay. She cooked and cleaned (not very well; why is it that older people don’t notice the splashy mess on the kitchen floor, the trail of crumbs on the carpet? ), bravely drove the baby and I to appointments (even on the motorway), and did the night feeds so I could surrender to sleep. When she left, I lay in her roll-away just to smell her perfume. I missed her terribly. The birth of my child had triggered a soggy and fierce longing to be a baby again in my own mother’s arms. Despite the hatred, the anger, the years of honesty unspoken, the strength of this yearning astounded me. I remember nothing of my father, except for what my mother told me: that my baby had his eyes. On Tuesday night, she decided to spring-clean the house, even though it was May. It did not take long. At 9.44pm she took the one bag of rubbish out to the bin. She stood very still and listened. Next door a dinner party was coming to an end, the rustlings of imminent departures sneaking through the branches of the pohutukawa. A couple emerged and kissed each other on the mouth before getting in their car. The easy familiarity, the sense of a shared history, was palpable. She went inside and sat on the edge of the bath, and remembered to breathe. When it was nine minutes past midnight she went to bed. When I met my husband I was 34. By then the mating game had changed. Flirting no longer entailed the delicious fear of stare-down; now there was only the desperation of intellectual tennis. But ah, Michael. I sank into him as into a hot bath after a day of sweat and tears and snow. On our second date he took me driving out past Henderson, to the very end of the motorway and then further, into the wild west. We stopped; I read and drank, he worked. As he wandered down hills and over paddocks, taking careful photographs and recording distances, I thought: This is a man who takes life very seriously. I also thought: That is precisely the kind of man I need. And when he got back in the car, all legs and clipboard, smiling and smelling of sun, I thought: this man will never hurt me. But he did. How could he not, when the world promises so much then delivers so little? When I first moved to Auckland I was terrified of driving on the motorway. I would take every detour imaginable. Now, I don’t even think about it. I get in my car and I turn right and left and I merge like a zip and I give the finger to assholes. But I don’t talk on my mobile anymore. I remember one day when my baby was 18 months old. We were wilting in the heat, that oppressive Auckland closeness that saps your will to live, so I took him to Mission Bay for a swim. Afterwards we felt much better and I bought us both an ice block for the trip home. And just as we were coming off the Greenlane roundabout we were nearly sideswiped by an old man in a blue Mazda who indicated left then swerved right. He missed us by millimetres. I was so shaken I had to stop and cry for a little while. And then my son smiled at me and said “Mama!” in such a surprised and delighted little voice, as if he had only just realised how wonderful I was and how magical it was to be here, alive, on this day, with me. When she woke, she had a sudden craving for McDonalds. Burger and fries. Would you like Happiness with that? She wondered if she should write before she ate, afraid that a Big Mac would pollute her thoughts as well as her body. Her mind segued to an image of Christ at the Last Supper. This is my blood, shed for you. This is my body, broken for you. Eat it in remembrance of me. The beatific, chalky face of Jesus morphed into that of Ronald McDonald. Suffer the little children to come unto Me. The grotesque smile, the open arms and useless plastic trinkets, consumable accoutrements to worship and gluttony. The insatiable hunger to steal away our young. Ronald McDonald and Jesus Christ, she thought: spot the difference. I want to tell you about the kind of man Michael was. He was always late. He did all the housework and sometimes I wished he wouldn’t. He was good and sensitive and honest and he adored Christmas. He ate far too much chocolate and he cried when we vaccinated our baby for the first time. He drove like a Nana. He couldn’t keep a secret to save himself, and he loved to travel. He also loved the ballet and gingernuts and Coronation Street (to the point of obsession) and cups of tea. He sulked. He hated public speaking and dirt and anyone or anything that invaded his privacy. When he was young he played the clarinet. He noticed things. For example, when my face cream was running out he would notice, and buy me a new one. He was hopeless at handyman stuff and anything to do with computers. He was the first and only man I ever loved. I do not wish to speak about my son. Only this: that I had searched my whole life for him, but it was only when he was born that I knew it. And that if I had been given the choice between a child who would live and my child who died, I would still have chosen him. Last night there was a knock on the door. My neighbour’s face was a study in fear. As at a funeral, when the family consoles the guests, I invited her in, put the jug on, laid gingernuts on a plate. After ten minutes of polite avoidance, the deafening tinkle of awkward teaspoons, she leapt. She was desperate to offer me an out. She needn’t have bothered; I am skilled at saying no. No, no, no, no, no. It was all I said for hours, after it happened. She drew breath, scratched her nose, tossed out a brief laugh. “OK. My daughter – you know Siobhan, my younger girl?” I did. Both she and her sister Siaorse used to say hello and often chat to me when I was out in the garden, before it happened. They were friendly girls, open. Siaorse used to speak excitedly of her upcoming OE to Europe. The family came from Northern Ireland, originally. You could still hear the distant lilt in my neighbour’s voice, but not in her daughters’. Her husband was distant, shy. He never spoke to me. She continued. “Well, she’s doing NCEA Level 3 this year and she’s struggling with her English, and, well, I know you’re a writer, and I was just wondering if you might…I’d pay you, of course, it would just be an hour a week or so, or, you know, less if you don’t have the time, I’m sure you’re um, busy…” She had taken in the television, the magazines, the piano: the busy absence of others. I suddenly felt desperate to cut short the stilted conversation. As fragile as I was – an object of fascination before pity – in that moment I felt strong. I said yes. Last night Michael came to me in a dream. At first I didn’t recognise him. He was indistinct, like vapour, or candy floss as it is spun wispily into life. But then I recognised his scent – a mixture of Eternity for Men and grass and tea leaves. He sat with me for a while as I talked about mundane things like the broken halogen above the range hood and the fact that I was developing a bunion. I told him I had started tutoring again. He seemed happy. Then he talked to me about our son. As he talked, for a fleeting moment I thought I heard my little boy’s laugh, could smell his cotton-fragranced hair, touch his small fingers. Then the dream segued into another. I was in the ocean, marooned in the insane, exquisite horror of a night storm. I was clinging for life, for dear life, to the one remaining turret of a castle. It was crumbling and now leaning to one side, threatening to snap at any minute and plunge me into the whirling mess of noise and wet and death. Everything around me was grey. The turret, the water, the sky, the smell. I could see nothing but waves and foam and that one sweet saviour carved in stone. I tightened my grip, arms and legs flung as around a lover. Somehow I knew that to save myself, I had to let go. What would it feel like, I wondered? How would it be to tumble into something as insubstantial, as unpredictable, as this anchor-less, turret-less sea? I let go. I fell. I sank. I lay on my back and unlocked, spread my arms. Laid my chest open and bare. Gave myself up to the who-knows-what-will-happen. It was warm and the sun cut through the wet and all was peace. Then I started to kick, fighting for the surface. I entered the light, then broke into the above. The turret was gone. I rose into the air, up and up and up. I spread my arms wide – a resurrected Christ – and tilted my face to the infinite sky. For the first time in months there were no tears when I woke. The last page was finished. The trial was over.